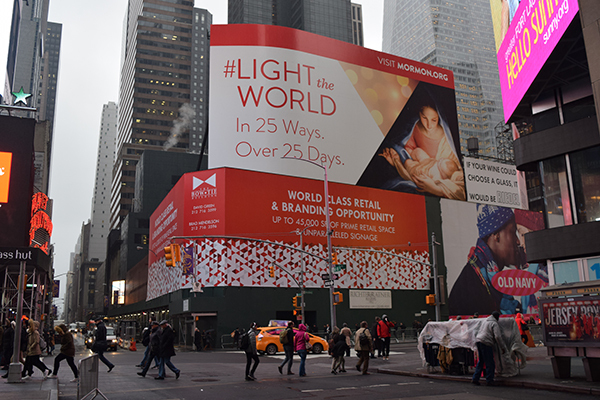 We have a great opportunity as Youth leaders to help our Young Women and Young Men participate in this year's #LightTheWorld Christmas campaign. This lesson is a starting point for you to use in your own Youth groups. Use all or just some of these ideas! This would be a perfect lesson to teach the first Sunday in December. Find a few images of Christ that you have or get some from your church's library. Hang them around the classroom before class if possible. 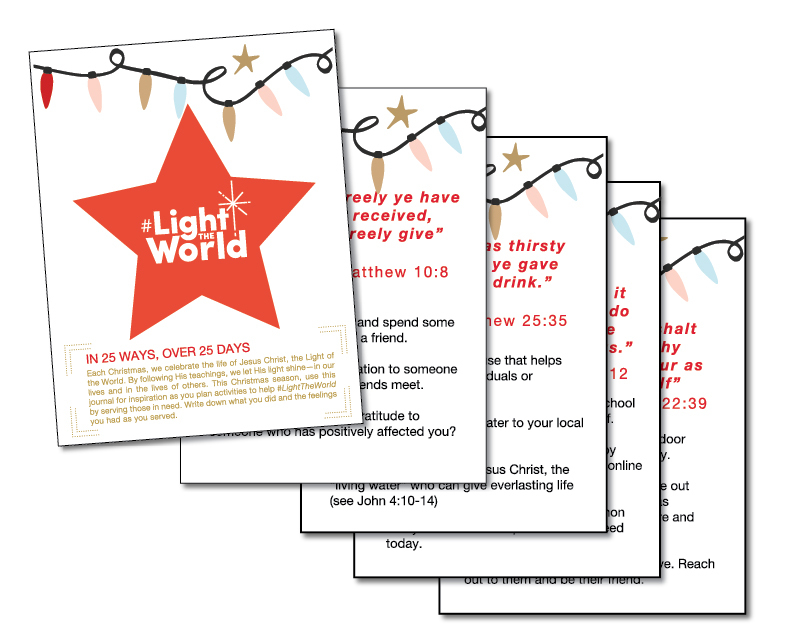 Start your lesson by asking your class if any of them participated in #LightTheWorld last year. If you have some hands raised, tell them that you want them to think about their experience and possibly share one or two things that they did and the results they received from their service at the end of the lesson. In the Come, Follow Me teaching method, have a discussion on #LightTheWorld. Ask the class if they understand why we have it. Why does the church spend so much time and money on this campaign? Did they see the large billboard that was in Time Square last year? It will be there again this year! Show the video that is also found on the above link on mormon.org. The entire video will be released November 24th. The one on the site now is a teaser video. I had the opportunity to view the entire video and it's wonderful! My favorite part is seeing real-life examples of people serving during last year's initiative! As you discuss the third poster, invite those with scriptures to stand up and read their scripture. If you want to get creative, draw a wavy line on the board. 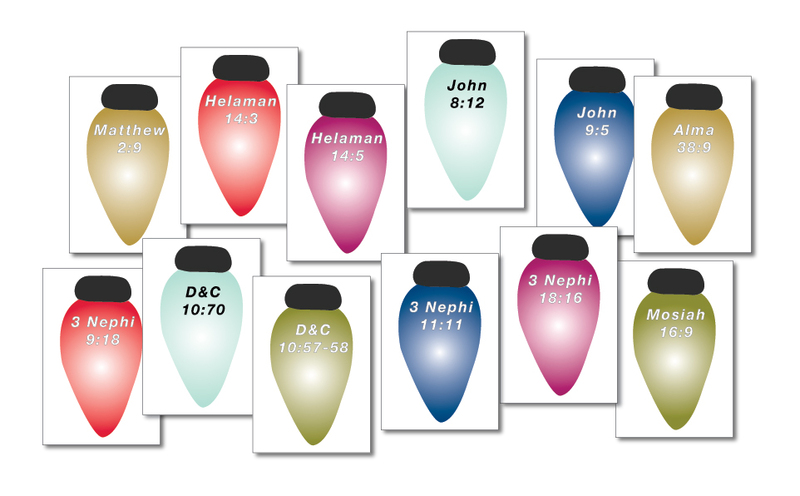 After they have read their scripture, have them hang up their lightbulb on the wavy line, so when all the scriptures are hung-up, it resembles a string of lights. 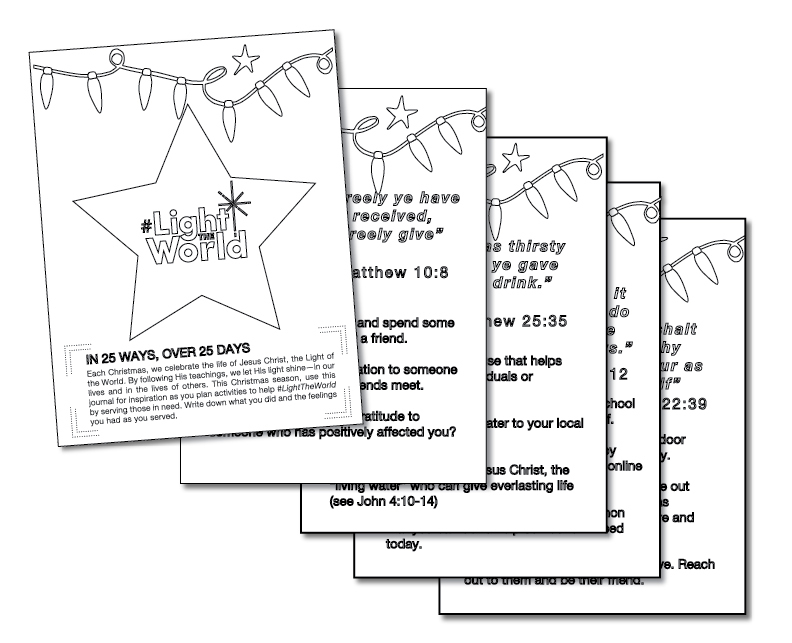 Ask your class to be thinking of ideas on how they can #LighttheWorld this month. Hand out the following journals. To assemble the journals, make sure to print full page without margins. Cut on the small black cut lines so each page is cut into fourths. Place the pages so the images are on the backside of each page (except for the title page). That way, when the journal is opened, on the left hand side will be the Daily Activity ideas and the right hand side will be a blank page. 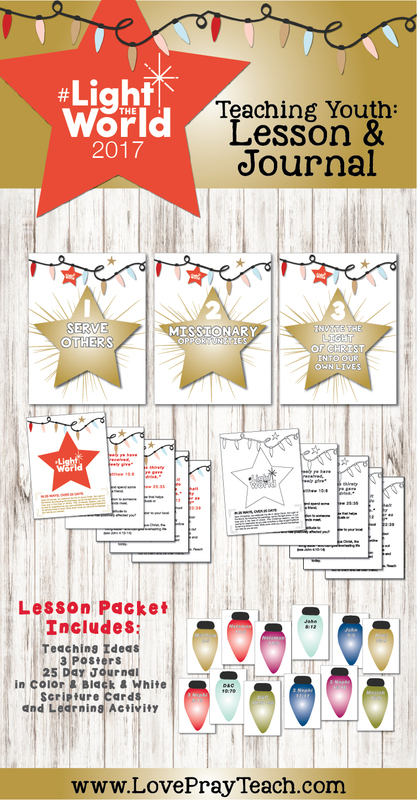 Encourage your class to use the blank pages to write their ideas and what they did that day, along with how they felt after doing their service. This will be a beautiful keepsake! Take some time as a class to look through the journal. Ask if anyone would like to share ideas that they have to #LightTheWorld. Explain to them that if they are having thoughts and ideas come into their heads while looking through the daily scriptures, that is the Holy Ghost helping them! 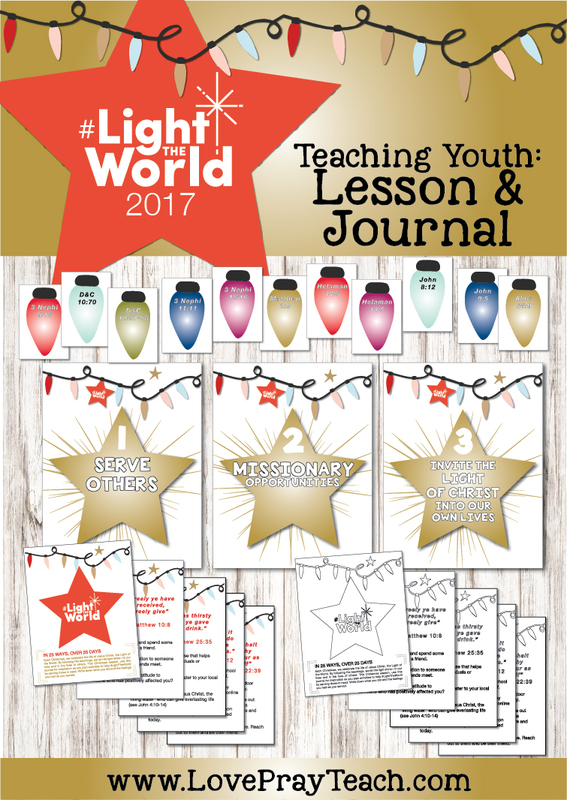 Allow some time at the end of class to have those who participated in #LightTheWorld last year share what they did and the outcome of it. Hopefully, you'll hear some great testimonies! If you need to fill more time, show the Bible video on LDS.org of Christ's birth. End with your testimony of the Savior.